One of the cardinal reasons you should upgrade to Windows 8.1 is so you can boot to the desktop. 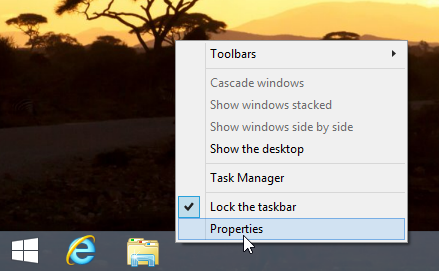 In Windows 8, there were task scheduler tricks, third-party Apps and registry hacks you could use to force Windows to breeze through the infamous Start Screen. 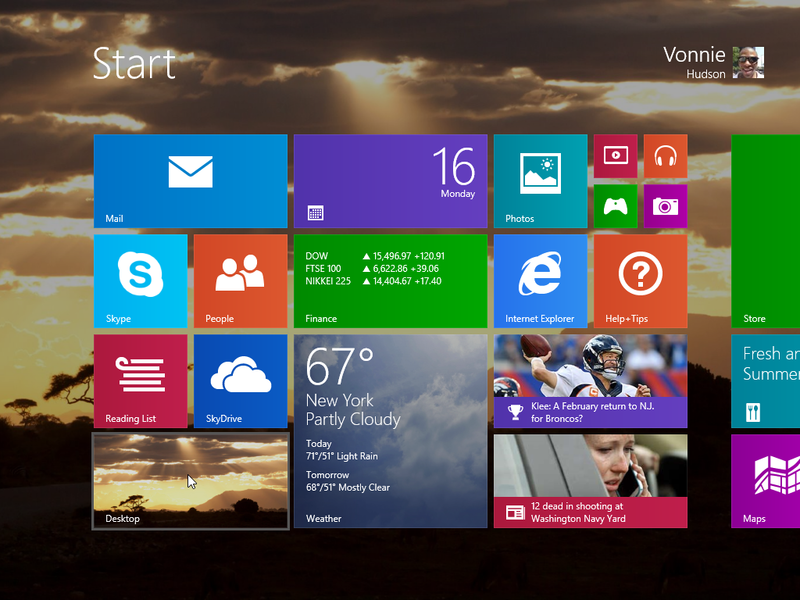 In Windows 8 and 8.1, the Start Screen is a motley collection of playful tiles and jumbo buttons that is better suited for a touchscreen than a laptop; that’s why it’s super annoying to to deal with this feature after starting up your computer. I mean, who really wants to see a disjointed mess of multicolored boxes after booting up a Windows machine? Well, A bevy of querulous Windows 8 users expressed their discontent with the Start Screen. And to my surprise, Microsoft not only considered but also implemented an option to boot directly to the desktop in Windows 8.1. The public won’t see the final version of Windows 8.1 until next month; however, if you’re using the public preview version or just want to know the newest Windows 8.1 features before the official release drops, then you’ll benefit from using boot to desktop. But although the option exists, it isn’t conspicuous. Okay, I’ll give you Boot to Desktop but you’re still gonna have to find it. Boot the computer and you’ll see the lock screen. Press any key to unlock then enter your password on the login screen. 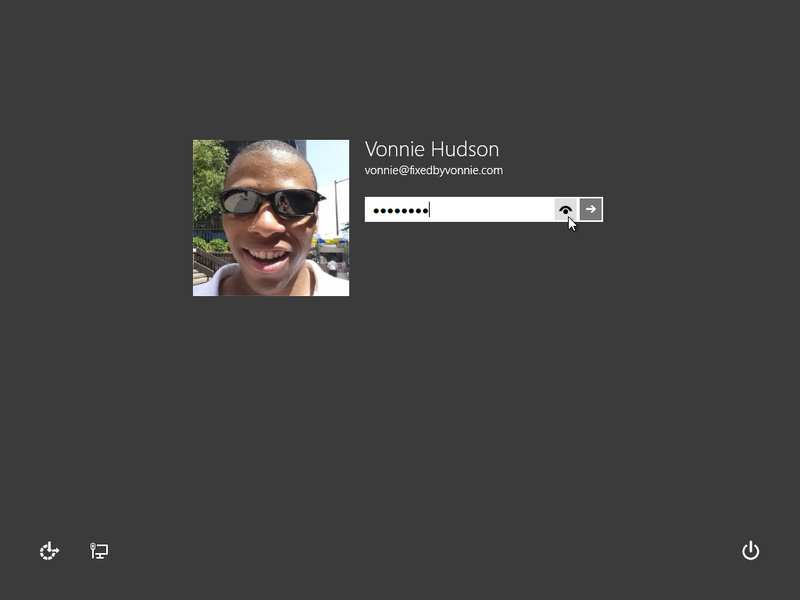 When the Start Screen pops into view click the Desktop tile in the lower left corner to open the traditional Windows Desktop. 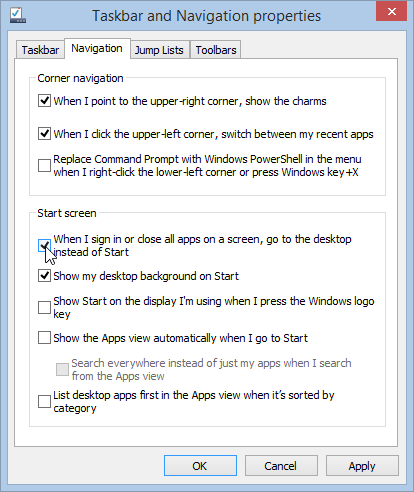 The in the Taskbar and Navigation properties window, click the Navigation Tab and put a check box in When I sign in or close all apps on a screen, go to the desktop instead of Start. Now if you reboot, Windows will completely bypass the desktop and zoom directly to the desktop. Every computer since Windows 95 booted to the desktop; therefore, why did Microsoft make the ostensibly inane decision to “fix” something that wasn’t broken? I don’t know, but it’s nice to know that we can easily get our desktops back without any hacks or apps. The big problem with Windows 8 is that Microsoft was trying to coerce everyone to adopt an environment optimized for touch devices. This pushed everyone else with regular laptops into the periphery and put what Microsoft determine to be “the future of computing” into the foreground. But the problem with this of course is that everyone doesn’t have a touchscreen (or even want one). I see two concurrent trends: As the nascent touchscreen market becomes increasingly ascendant, user adoption rates is in stagnation because most people are averse to change. Moreover, but touch devices typically aren’t powerful enough to run the full fledged desktop applications that businesses need for serious productivity. For this reason, I think Microsoft made a judicious business decision to resurrect the Boot to Desktop feature that has been with Windows since its genesis. Before this feature, Microsoft was alienating their customers and people were in an uproar about this seemingly arbitrary change but now users have regained the ability to go directly to the desktop again. What do you think of the boot to desktop feature in Windows 8.1? 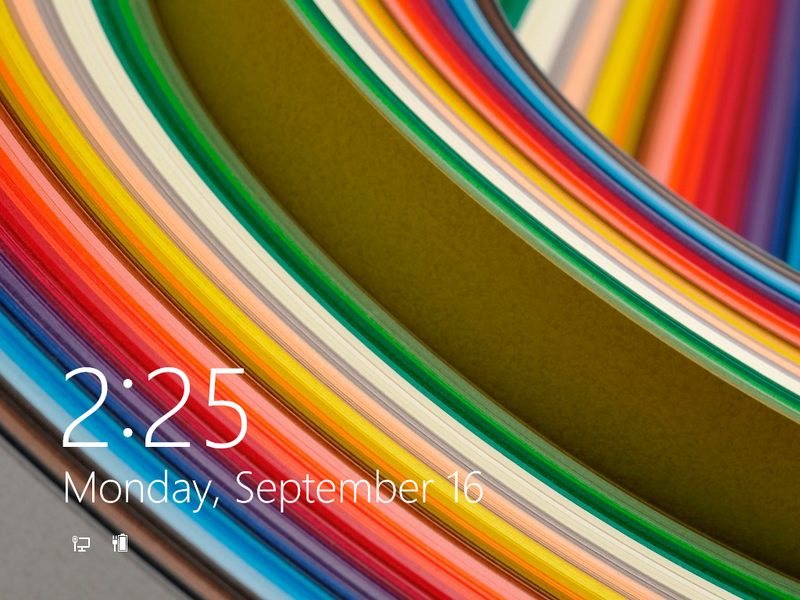 Do you feel like Microsoft is trying to make a one-sized-fits-all operating system? Let me know in the comments below. ‹ What is the Galaxy S4 Adaptive Display?